Don’t mind me. I just think saying things in an Oprah voice will never not be funny. Did you know I used to be an ice cream scooper? In high school, I worked in a movie theatre with a restaurant inside and I made all the milkshakes, cherry limeades, sundaes, etc. It was a hard job, but someone had to do it (poor, poor me). 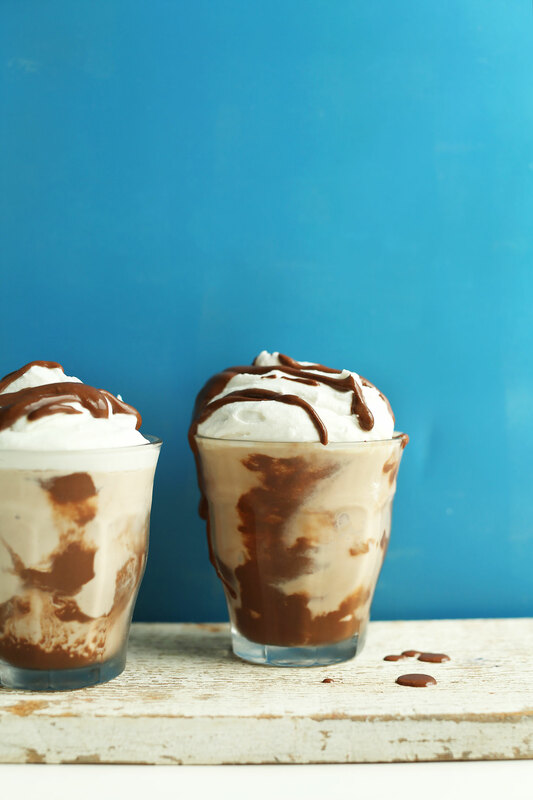 One of my favorite things to make was chocolate malts. To be honest, if there was a little extra leftover, it totally went into my cup. Shhh, don’t tell my old boss. I’m sure there’s still some way I’d get in trouble for that. This, however, isn’t your average malt. For starters, just 3 ingredients, 1 blender, and 5 minutes required. 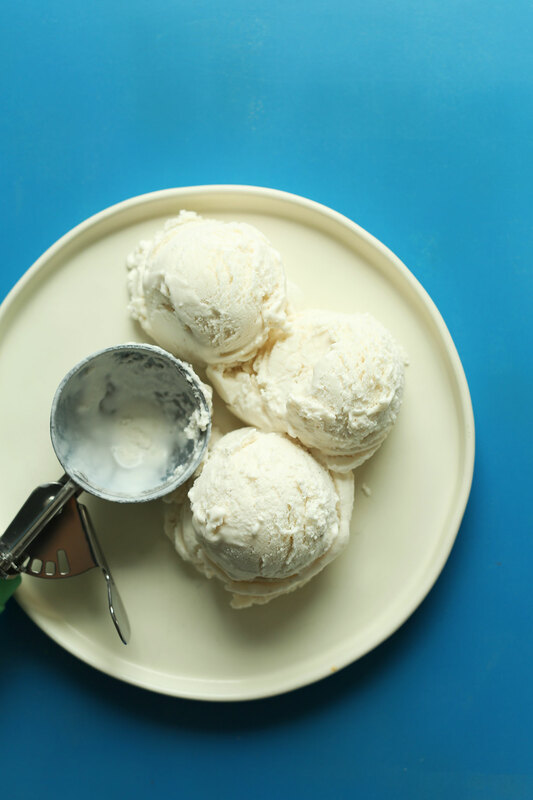 Second, it’s dairy-free thanks to Vanilla Bean Coconut Ice Cream (hubba). Third, it’s made with HOMEMADE Vegan Chocolate Syrup (that’s naturally sweetened)! Lastly, the malt flavor doesn’t come from some mystery powder (what is that stuff anyway?). It’s the superfood maca. Maca not only adds antioxidants and amino acids and rainbows and unicorns (I kid, I kid), it also adds a smoky, malty flavor that is reminiscent of a traditional malt. Yipee for healthy swaps! Look at that swirl, tho. This is the perfect dessert to make when you want to indulge while also reaping a few health benefits. Not into chocolate (who are you?)? Leave it out and go for vanilla! Or add some strawberries for a fruity twist. Dream big, people. This recipe is a great gateway into the world of maca powder, which can also be added to things like coconut yogurt, hot chocolate, chia pudding, and smoothies! If you try this recipe, let me know! I love your comments, ratings, and (as always) your photos tagged #minimalistbaker on Instagram. Cheers, friends! 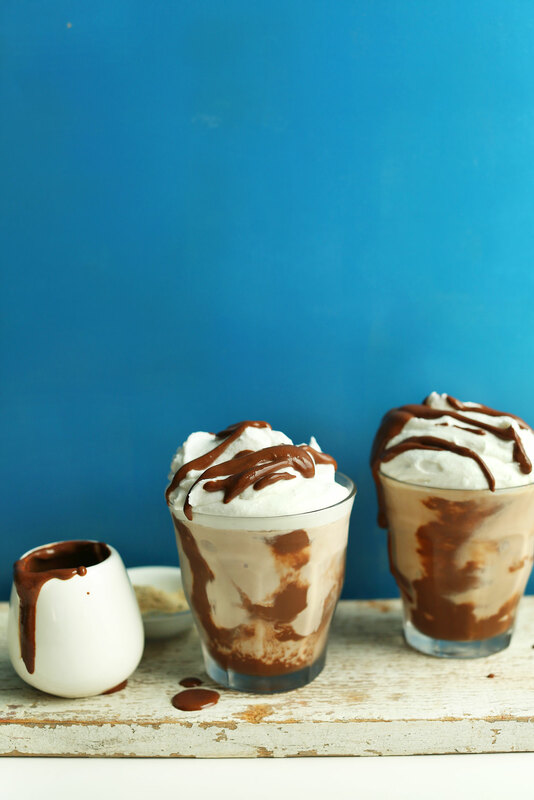 Easy, 3-ingredient vegan chocolate malt with creamy vanilla bean coconut ice cream, naturally sweetened chocolate syrup, and superfood maca powder! 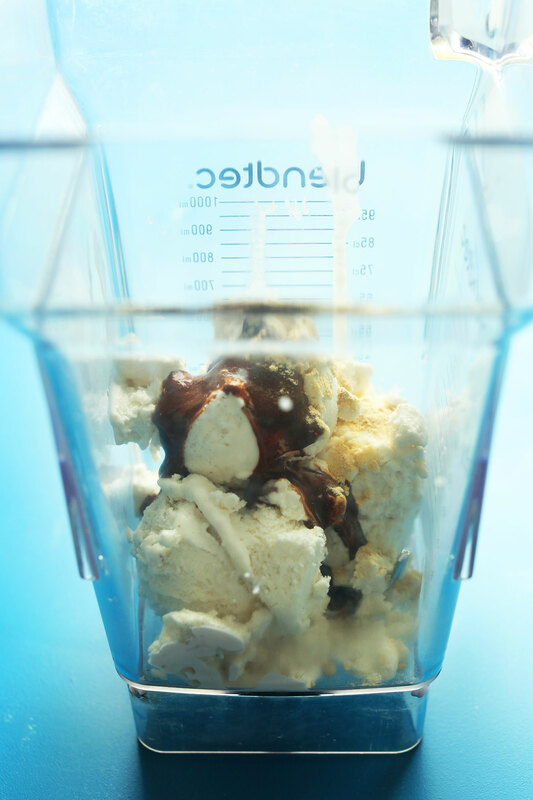 Add ice cream, chocolate syrup, and maca powder and blend on low until creamy and smooth. If it has trouble blending, add a bit of almond or coconut milk (I didn't find it necessary and prefer my malts thick). 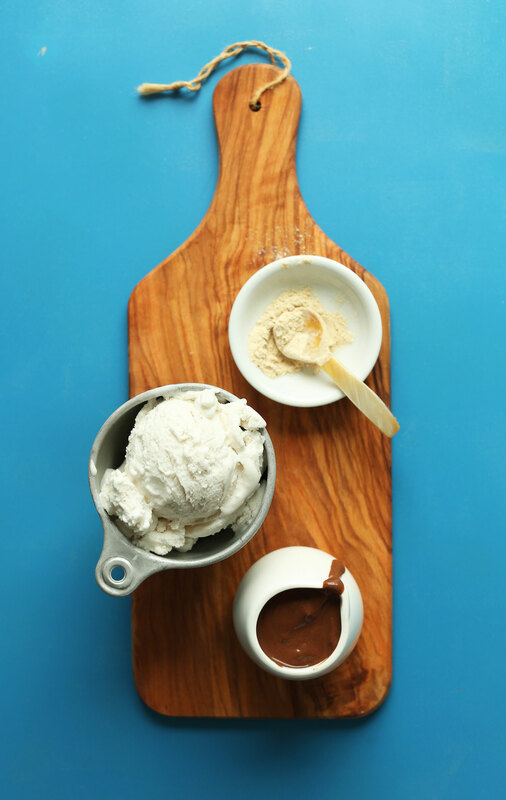 Taste and adjust flavor as needed, adding more chocolate syrup for intense chocolate flavor or maca for a more "malty" flavor. 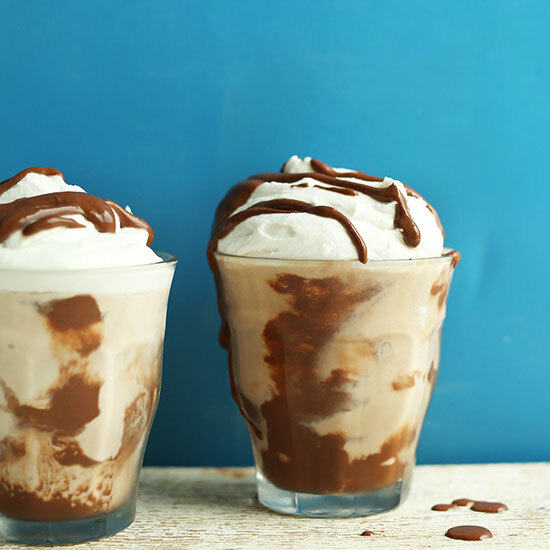 Enjoy as is or top with coconut whipped cream and more chocolate syrup (optional). Best when fresh. *If you don't care to make chocolate syrup, either use a store-bought vegan-friendly brand, or try subbing cocoa or cacao powder. *Maca powder adds the malty flavor in this dessert. If you can't get your hands on it, just leave it out! *Nutrition information is a rough estimate calculated without additional chocolate syrup or coconut whipped cream. Just made this, yum!! So glad you reccommended maca powder too, I really like the nutty flavor. I made my own lazy chocolate sauce by whisking while melting together vegan chocolate chips and almond milk. The maca powder even smells good. Do you have more recipes involving this ingredient you have just introduced me to? Hi Krissy! We don’t have too many recipes with maca yet, but I’ll be sure to pass your comment along and hopefully we do more with it in the future! So I am OBSESSED with malted milkshakes, well, just malt in general. Does the maca REALLY give it the malt flavor? It does!! Try it out! I made this last night and it was delicious! I added shredded dark chocolate on top and its amazing. In Papua New Guinea or I would be making it NOW! Enjoyed your humerous writing also! Oh great! Glad to hear you are seeing the world also! Enjoy! First off, it’s really really good! I did a modified version – I made 2 different flavors chocolate and raspberry and splice them together and finish it with chocolate on top. Lovely, thanks for sharing Austin! Looks super delicious.. Love it! Yummy! I can’t wait to try this and tell folks!!! Thanks!!!!! We made this for dessert last night and it was such a hit – we had over some vegan friends and wanted to impress them. We had to show them the recipe before they’d eat it since they were convinced it wasn’t actually vegan, lol! 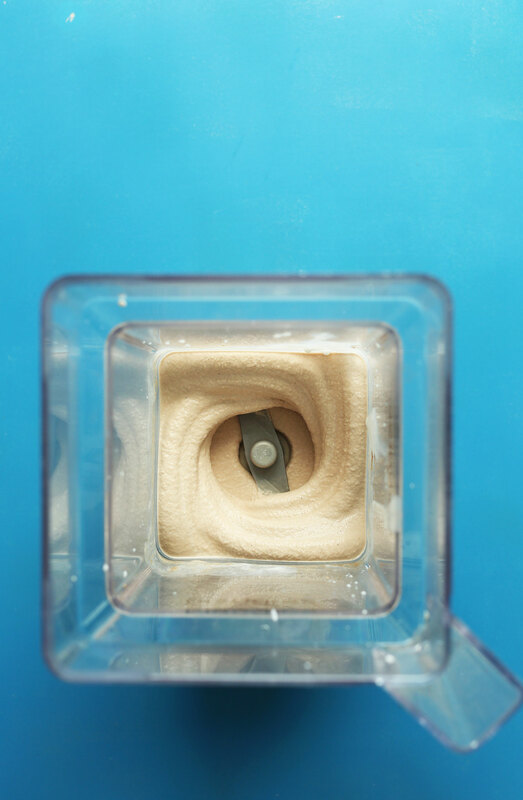 Swapping malt powder for maca powder is something I wouldn’t have thought of but it’s such an excellent idea – thank you Dana, I will definitely be experimenting with this. I have yet to experiment with maca powder but these are about to be my starting point. 1. That Blendtec swirl has me swooning. 2. I used to be an ice cream scooper too. Cold Stone Creamery baby! Have you done a comparison of Blendtec and Vitamix? Also, Paul, I will be doing a more indepth comparison between the two soon! Stay tuned! Oh yummy! I will definitely have to try this one out as dairy never seems to settle good with me. Me too, vanilla bean anything is amazing with a big zing in it!!!! I was actually an ice cream scooper for many years for a part-time job and it was a lot of fun~ I remember working with malt the first time “on the job” loved making milkshakes with malt, it was so fun. Great summer job for a teenager. This brings back fond memories.